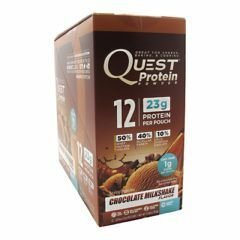 AllegroMedical.com presents The Quest Nutrition Quest Protein Powder - Chocolate Milkshake Protein Supplement Gluten Free. Great for shakes, baking & cooking. Less than 1g sugar per serving. No Soy. No Added Sugar. Gluten Free. Taste, Reimagined. Quest Protein Powder is a tasty, decadent blend. Even when it's simply mixed with water. We've transformed high quality protein into impossibly delicious flavors that are distinctly Quest. But we didn't stop there. Cheat Day, Everyday. Quest Protein Powder is a groundbreaking cooking companion for your favorite #CheatClean recipes. Ditch the junk for this perfect ingredient swap to turn a carb-heavy cheat into a protein-rich treat. Protein Per Calorie. Quest believes the greatest measure of a protein powder is its protein-to-calories percentage. The higher, the better. Quest Protein Powder has one of the highest percentages of any protein because we don't add any junk. It's just amazing taste and excellent nutrition. Use 8 ounces of cold water or other chosen liquid per full scoop of Quest Protein. Whip in a blender if possible for best texture. When adding fruit or other ingredients, more water may be needed to achieve desired consistency. Protein Blend (Whey Protein Isolate, Micellar Casein, Milk Protein Isolate), Cocoa, Natural Flavors, Contains less than 2% of the following: Sunflower Lecithin, Xanthan Gum, Cellulose Gum, Steviol Glycosides (Stevia), Salt, Sucralose. For weight reduction, use only as directed with a prescribed diet plan. Do not use in diets supplying less than 400 calories per day without medical supervision. Contains: Milk-Derived Ingredients. I really like this product and it leaves a pleasant smell after using it. Just wanted to let all know of the wonderful service you have provided. The free shipping discount saved me alone in not having to travel 30 miles to the nearest city where I may or may not get what I need. You did it again and I will be back!